ArchitectureChicago PLUS: Tigerman, Goldberg, Botta, Cobb, Simonds, Jahn, Sobek, Pecha Kucha 19, and a billion more - it's the September calendar! Tigerman, Goldberg, Botta, Cobb, Simonds, Jahn, Sobek, Pecha Kucha 19, and a billion more - it's the September calendar! So what's the deal about Labor Day that turns on the chill of Fall as if by switch? I don't like the end of summer, but I'm consoled by the fact that the pace of the September Calendar of Chicago Architectural Events has exploded like a Coke bottle full of Mentos, with over seventy great items and counting. And not even in that tally, there's the long-awaiting blockbuster exhibition at the Art Institute, Bertrand Goldberg: Architecture of Invention, plus a companion show, Inside Marina City: A Project by Iker Gil and E.G. Larsson, while the ArchiTech Gallery chimes in with Architectural drawing: from Wright to Goldberg. And then, mid-month, Chicago gets another new museum building with the opening of Depaul Art Museum's new home on Fullerton. This week starts out with a bang with edition 19 of Pecha Kucha, at Martyr's, on Tuesday the 6th, while over at the Gene Siskel, a new series Designs for Living: The Apartment Genre, kicks off with a last showing of Alfred Hitchcock's Rear Window, perhaps the most perverse study of the dynamics of life, exhibited and observed, in the adjacent compartmentalized boxes of a big city. On Thursday the 8th, Patrick Blanc talks about Vertical Gardens at the Alliance Francise, while on Friday the 9th at the of U of C Law School, Stanley Tigerman kicks off the Frank Lloyd Wright Preservation Trust's new series, Thinking into the Future: The Robie House Series on Architecture, Design and Ideas. On Wednesday, the 14th, Robin Rhodes lectures on Transition and Transformation in Greek Architecture at the Driehaus Museum, aka the Nickerson Mansion, while on Friday, the 15th, Rolf Achilles talks about Art Nouveau Book Art Design at the Second Presbyterian Church. The School of Architecture at IIT jump starts its fall lecture series on Friday, September 16th with a superstar constellation of Werner Sobek, Manfred Hegger, and Helmut Jahn lecturing on High-Rises for the Future: Sustainability, Architecture and Engineering Perspectives. Also at IIT, Dan Rockhill talks about his current work on September 28th, and Barbara Geiger talks about her new book on Landscape Gardener O.C. Simonds on Thursday, the 21st. Elsewhere on the new book front, Edward Wolner discusses and signs copies of his new work, Henry Ives Cobb's Chicago, at the Glessner House Museum on Tuesday, the 20th. Want more? How about a three-day symposium, Seaside at 30: Lessons from the First New Urbanist Community, starting on Thursday the 29th at the School of Architecture at Notre Dame, with such luminaries as Léon Krier, Andrés Duany, Elizabeth Plater-Zyberk. (will there be a surprise appearance by Jim Carey?) On Wednesday, the 28th, there's an all-day symposium on the 175th anniversary of Clarke House, and a two-day Great Cities/Ordinary Lives conference at UIC on the 16th and 17th. Preservation Chicago's fall fundraiser? AIA Chicago tours of Zoka Zola's Studio and the Lincoln Park Nature Boardwalk, and a discussion by Sheri L. Carter of the use of terra cotta at Mario Botta's Bechtler Museum? Geoffrey Baer? Dale Greenwood Green on Historic African-American Religious Architecture at Quinn Chapel AME Church? 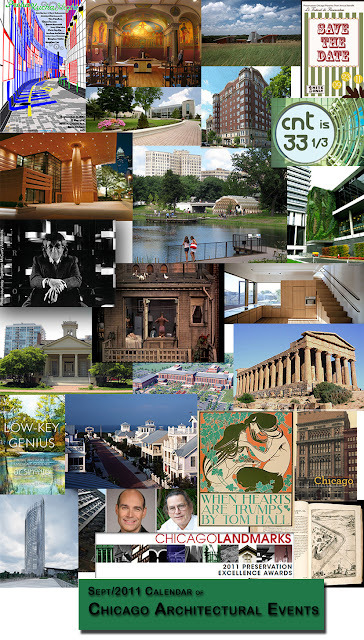 A preview at CAF of it's extraordinary October event: openhousechicago: Chicago's Hidden Gems? I could go on and on, but rather than reading about it twice, check out the nearly 80 items on the September Calendar of Chicago Architectural Events.